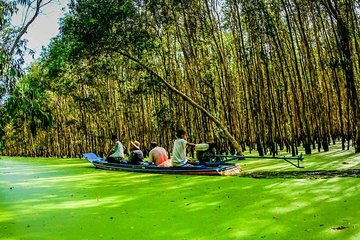 Scopri le meraviglie naturali e la cultura locale del Delta del Mekong in barca, in bicicletta e in auto in un tour privato di un'intera giornata. Il trasporto privato dal tuo hotel ti porta a una barca, che ti trasporta nei mercati galleggianti di Cai Be. Più tardi, esplorare l'isola di Tan Phong in bicicletta, incontrare un contadino locale e gustare il pranzo. La tua guida è sempre a disposizione per garantirti un'esperienza personalizzata e coinvolgente. Thuy pointed out many points of interest on our journey and even told jokes I found out later her English was self taught she is a credit to the company she works for. The actual trip started with a boat trip up n down river visiting a floating market and coconut candy factory where we sampled the sweets they make then it was back up river where we transferred to a paddle boat to take us through the swamps after we spent 30 minutes in the tranquility we emerged back on the river and transported to our next destination we picked up our bicycles and rode round cycle paths following our guide we ended up at a local house where we were shown round the extensive gardens full of home grown fruit which we had many samples of with our jasmine tea the owner of the house even sang us a traditional love song it was back on the bikes and on to our next house where we were given an extensive lunch with time to chill out in the garden before cycling back to pick up the boat for the return leg to ho chi Minh city. You could hire a car yourself and get to the delta but being chauffered there was definitely the best option for driving in ho chi Minh makes driving in London a drive in a village as I said at the start Thuy made the trip even better for us so if you want a good day out n sample some amazing things both good and bad I recommend this trip highly.